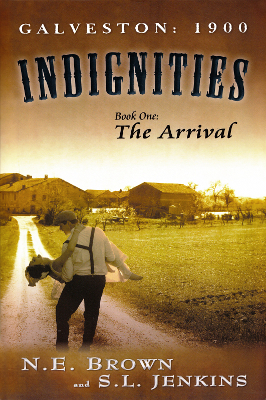 Description: Historical fiction set in 1900 Galveston. A young courageous fifteen year-old Catherine Eastman must face a new life in an orphanage after her mother is murdered by a drifter shortly after they arrive. The drifter, David Brooks, has his own dark past and a passion for prostitutes and beautiful women and often leaves them dead. A young man, ten years older than Catherine, gets permission to marry her and take her from the orphanage on her sixteenth birthday. Love and passion ignite as the two fall in love. Brooks' next conquest is Catherine, and after he abducts and violates her, he is caught and sent to a prison farm. All of this is happening while the city of Galveston is blithely unaware of the devastation that waits in the near future. By 1900, a monstrous hurricane is brewing in the gulf that will kill thousands and threaten to wipe the city off the map forever. 320 pages. Viewed: 2,405 times since October 4, 2013.